Ecologists need to collect samples of sea animals and seafloor sediments to study them. The data collected from these samples will help develop an understanding of the local marine environment. 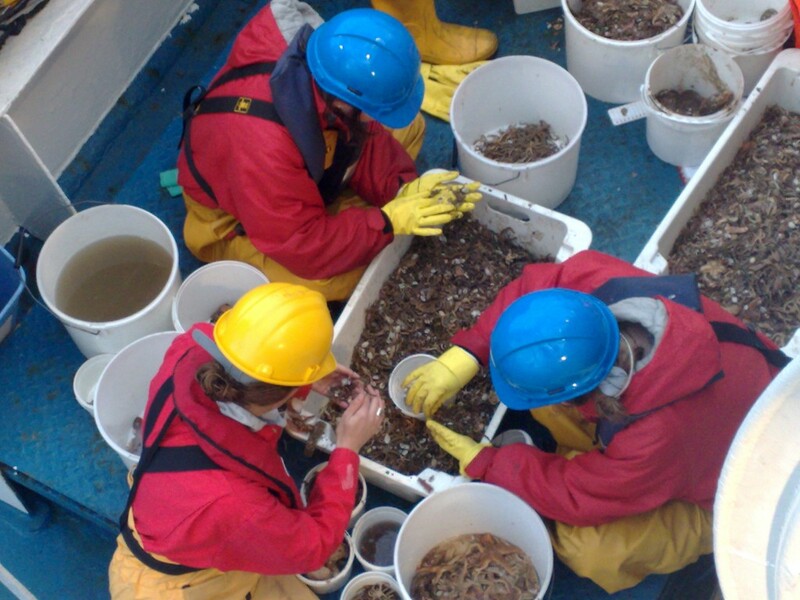 Most of the initial sample and data collection is done while working on the boat out in the study area. Each REC study is unique and ecologists adapt their methods for collecting information depending on the local environment and the research questions that are being asked. Although all four REC studies used the same key methods, they may have used them in slightly different ways. 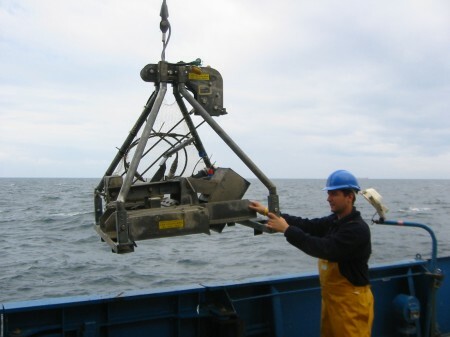 What did methods did the REC ecologists use to study the seafloor? Ecologists have a wide variety of methods of collecting and processing data. The REC ecologists used some of these methods. These are described below. The following section outlines the key methods for studying the ecology of the REC study areas. Click on the links below to find out about each topic, or scroll down to read the entire text. Ecologists examined information from a variety of sources to build their understanding of the Humber REC marine environment. 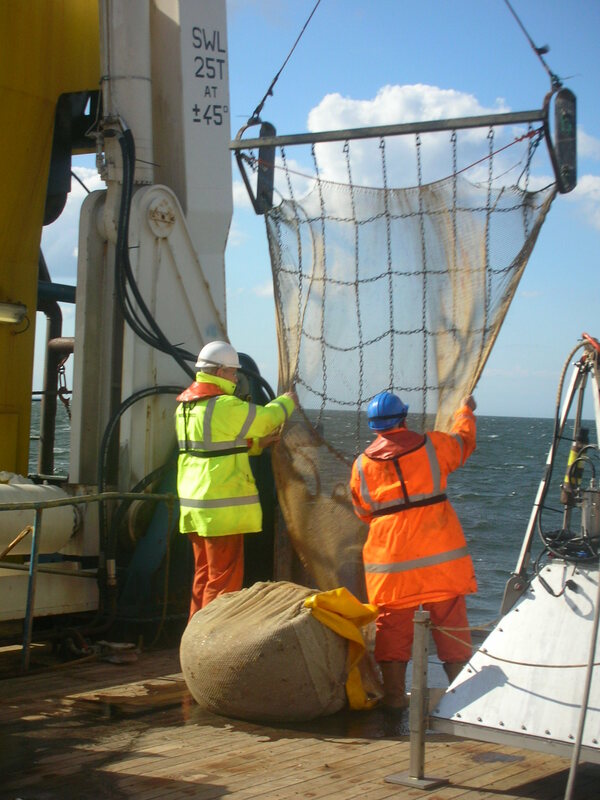 The overall aim of the ecological research was to understand the marine environment in this area. The information gathered will be used to monitor the seafloor for any negative impacts caused by anthropogenic factors and natural factors. There are two main ways that the ecologists collected data, through their own fieldwork and through reviewing information already available. A Desk Based Assessment (DBA) collects and summarises in a report information about a defined area, in this case the REC. This includes any relevant research already undertaken and other sources of information about the marine environment for the study area. 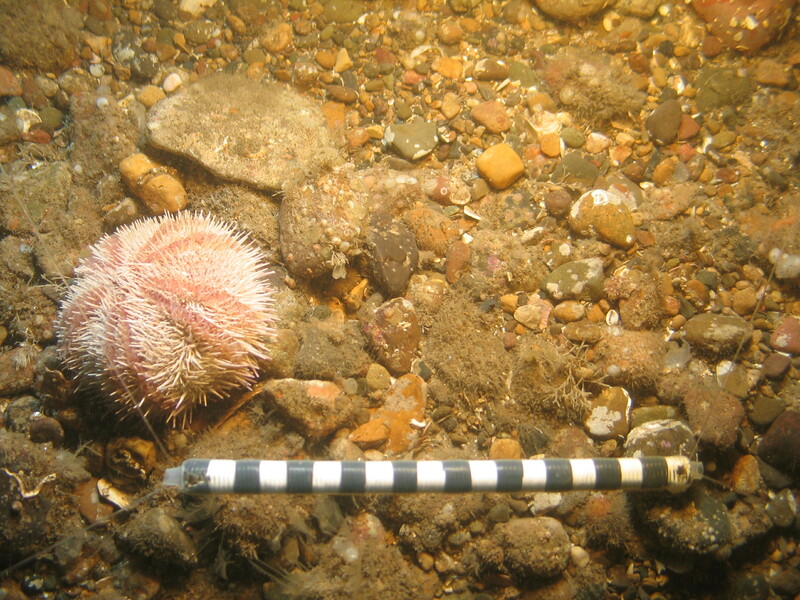 The North Sea has been the subject of extensive marine research over the last century. Ecologists reviewed information such as birds of special interest, protected marine areas, fishing industries in the area, cetaceans (e.g. 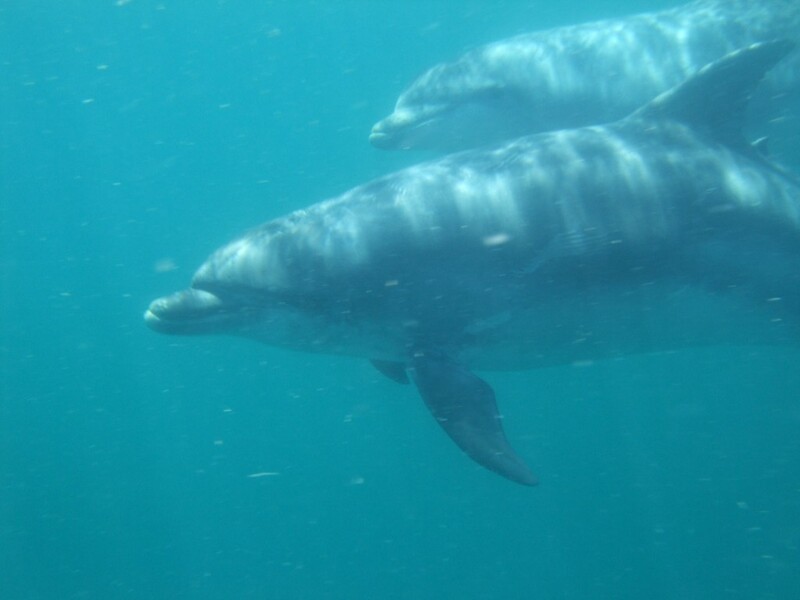 dolphins) and pinnipeds (e.g. seals). The Hamon Grab is a rectangular frame that supports a sample bucket. 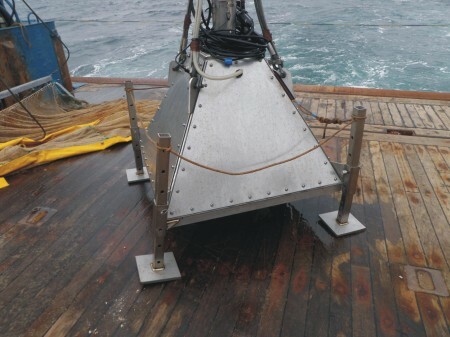 It is slowly lowered to the seafloor from the boat to collect sea animal and seafloor sediment samples. 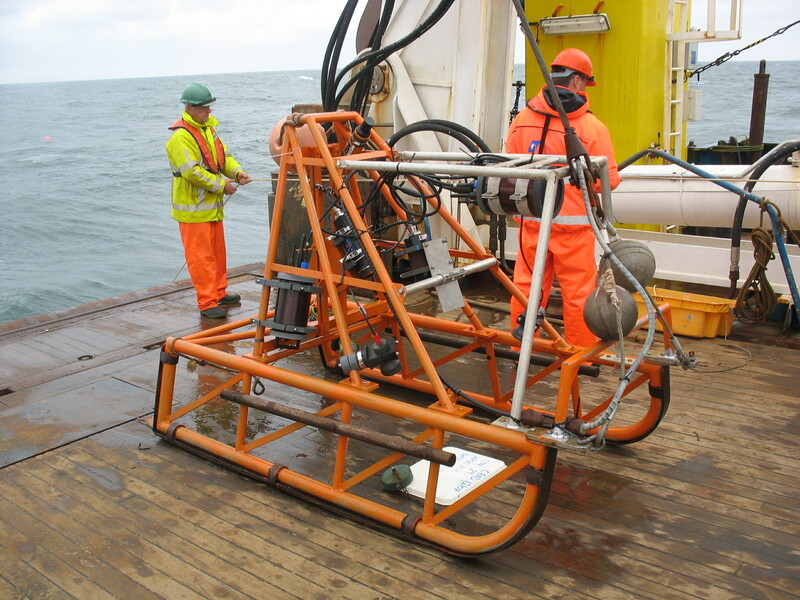 On reaching the seafloor, a mechanical arm drives the bucket through the sediments on the seafloor. This means it is only used where the seafloor is made up of sands and gravels, rather than rock, where it cannot scoop up the seafloor. The Hamon Grab collects the sample and seals it with a metal plate that prevents the sample falling back out. The size of the sample taken is 0.1m3 in area and up to 15 cm deep. The maximum volume of sample taken is 12 litres. If the sediment particles are very large, for example cobbles, it may be difficult to collect a large enough sample. At each sample station up to three attempts are made to take a sample, to ensure that there is enough sediment in the Hamon Grab bucket for the ecologists to study. Back on the boat, the ecologists empty the sample into a container and photograph it. A small part of the sample is taken for measuring the sediment size of the seafloor and the rest of the sample is sieved and sorted to remove all the animals. The ecologists then identify and count all the animals in each sample. Analysis of the sediment sizes and identification of the animals takes place in a laboratory away from the boat. The Beam Trawl collects larger and more mobile sea animals that live on or above the seafloor. Ecologists attach a net to a heavy steel beam. Chafers and a chain mat that prevents the collection of large boulders in the sample protect the net. The Beam Trawl is deployed from the stern or back of the vessel and is towed for approximately 500m at a speed of 1.5 knots. The location of these trawl runs coincides with the locations of Hamon Grab samples and video camera runs. Onboard the ship, the ecologist empties the samples into containers, photographs them and then counts and identifies all the animals. Seeing the seafloor and the communities of sea animals living on it is vital for the ecologists’ research. Can you guess from its name where you will find this camera? It is a miniature camera attached to the Hamon Grab. When the water is turbulent the Ham-Cam is towed to take video/film, in a similar way to the sledge. 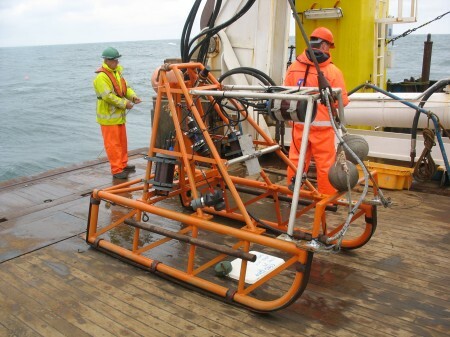 Geophysical survey images are also useful for ecologists as they can show patterns on the seafloor such as sand waves, rocky and biogenic reefs, These are potentially important habitats. Back in the lab, the Hamon Grab samples and any remaining unidentified animals from the Beam Trawl samples are studied. First, the REC ecologists divided the samples by ‘phyla’, which is a type of biological classification. 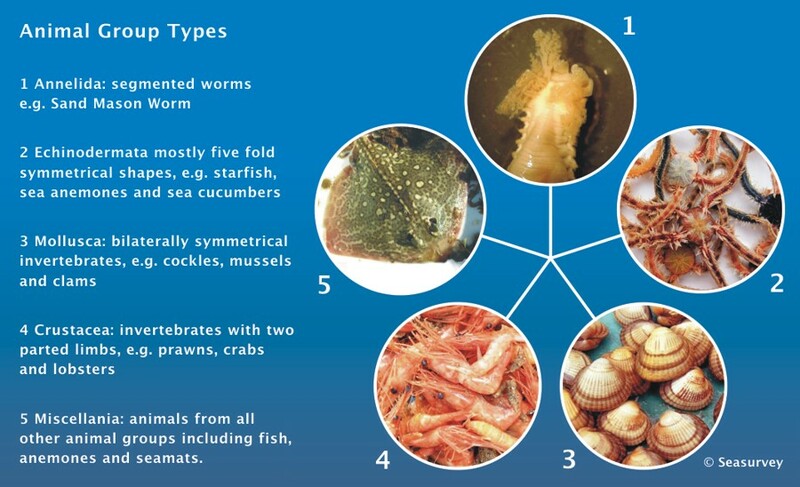 The types are Annelida, Echinodermata, Mollusca, Crustacea and anything else goes into Miscellania. They then take each ‘phyla’ and identify and count the indiviual species in that group ; this is the job of a taxonomist. For example for the Humber REC they found 684 different species of benthic macrofauna through the Hamon Grab samples and 125 different species of benthic macrofauna from the Beam Trawl samples. The marine environment is very complex so ecologists use the EUNIS classification system to describe it. In the sea, there are many different types of habitats and hundreds of different animals. For example, the seafloor may be rocky or it may consist of a particular combination of sand, gravel and mud. Different groups or combinations of animals will live in the wide variety of habitats in the marine environment. So ecologists need a simple way of describing what lives on the seafloor and they do this by describing groups of similar habitats and animals. EUNIS stands for the European Nature Information System and gives a list of such groups of habitats and associated animals. These groups are called ‘biotopes’, a mixture of the habitat, such as rock or sand, and the animals that live there. Each biotope has its own code and description. For example, Biotope A3.21 is ‘Kelp and red seaweeds on moderate energy infralittoral rock’. Infralittoral is an ecological word that describes the part of the seafloor where plants grow. The EUNIS biotopes are a useful way to describe areas of the marine environment because it is a classification scheme that can be understood by marine scientists all over Europe. Using the EUNIS classification system, REC ecologists produced biotope maps. When the ecologists have analysed and classified their samples into EUNIS biotope categories, they need to produce a map to show where these categories are located in the study area. However, it is impossible to sample every bit of the seafloor in the REC study areas, so producing a useful map involves a process called ‘modelling’. This process makes an estimation about which biotope is likely to belong to the unsampled areas – it fills in the gaps. Ecologists use a wide range of data to calculate the most likely biotope present. 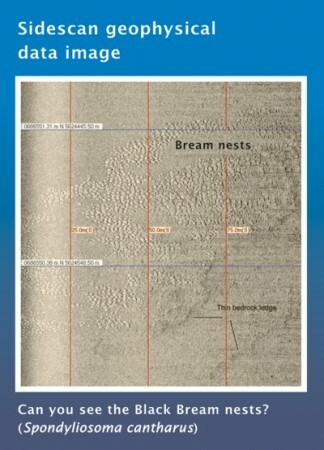 This includes data such as the water depth and tidal currents. They also use geophysical images and data to suggest what the seafloor is like, which helps identify the possible habitat type. Based on these informed estimates, the REC produced detailed biotope maps for the whole of each study area. These maps can be understood by many people, not just the ecologists and biologists that created them, and can be used to help decide which areas need to be protected. 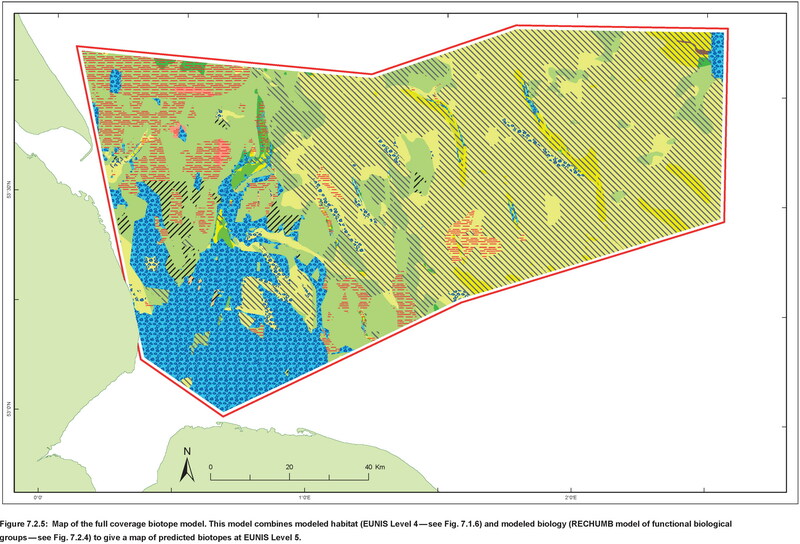 The biotope map below is for the Humber REC study area.